How much will my home loan repayments be if I choose a honeymoon or introductory rate home loan? If there is the question you have asked yourself, you can use this FREE Mortgage Introductory Home Loan Repayments Calculator to work out what the minimum weekly, fortnightly or monthly loan repayments would be for any loan amount. This introductory mortgage repayments calculator tells you monthly, fortnightly, or weekly home loan repayments of a introductory home loan. I find the fortnightly mortgage payment or bi weekly mortgage payment is really useful because I am paid biweekly. The mortgage home loan repayment calculator allows you to compare up to five home loans. You can also see how extra repayments can affect your home loan mortgage repayment in terms of time and amount. 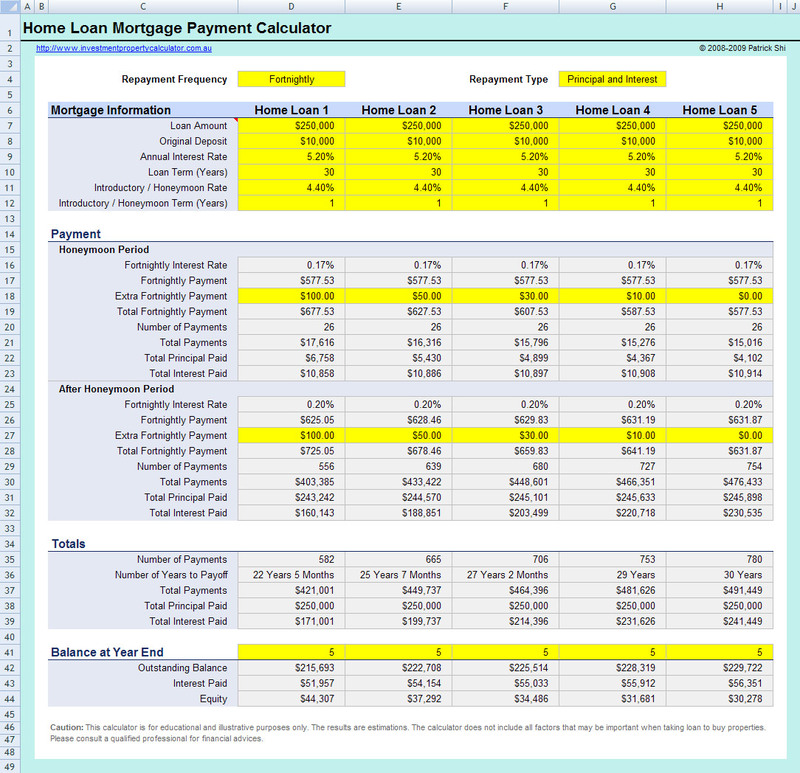 Download FREE Mortgage Introductory Home Loan Repayments Calculator Now! For your information, introductory or honeymoon rate home loans offer a low interest rate for an introductory period, usually for the first couple of years and could be fixed or variable. Once the introductory or honeymoon period is finished, the interest rate usually reverts to a higher rate. Although you can reduce the principal (and thus the the required interest payments) quickly by making extra repayments during the introductory period, the banks normally charge high exit penalties if you discharge these types of mortgages within the first 3-5 years after settlement. If you're considering taking out a home loan with an introductory or honeymoon rate, make sure you do your own research and compare all your options first. You may find that by sacrificing the temporary saving from an introductory or honeymoon rate home loan, you'll end up with a home loan with more flexibilities, more features, lower overall fees, and even less total payments. Or you might find that an introductory home loan might save you a couple of hundred or thousand dollars if you refinance your home loan after the introductory period. If you plan to refinance your home loan, there is a Free Mortgage Home Loan Refinance Calculator that you can download to do mortgage refinancing analysis. If you plan to buy an investment property, you might find that the Free Investment Property Calculator is quite useful.